"Undergraduate research is a student-faculty collaboration to examine, create and share new knowledge or works in ways commensurate with practices in the discipline" (Hakim, 2000, p. 1). 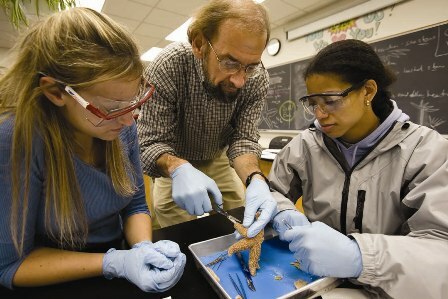 Faculty and students dissect a starfish together. Photo courtesy of Randolph College. In an undergraduate research experience, students collaborate with faculty on actual research projects, learning about both a particular topic in a field and the research process in general. The Council for Undergraduate Research (CUR) defines undergraduate research to be any "inquiry or investigation conducted by an undergraduate student that makes an original intellectual or creative contribution to the discipline." Kinkead (2003) writes that "another hallmark of undergraduate research is the role of the mentor faculty member who guides the novice researcher and initiates the student into the discipline" (p. 6). The National Conferences on Undergraduate Research (NCUR) and CUR argue that undergraduate research is a four-step learning process. Studies of undergraduate research experiences show that students, faculty, postsecondary institutions, and the community at large benefit from research done by students. The advantages of undergraduate research to students include but extend far beyond developing research methods skills. Through the engaged learning that occurs, students develop in both cognitive and affective respects, strengthen personal and professional skills, and develop more focus to their career and graduate school aspirations. Evidence shows that undergraduate research can strengthen a faculty member's teaching and research, advance knowledge in a field, and improve retention. Undergraduate research can also offer meaningful contributions to the campus and community when it produces results and policy recommendations that leaders can reflect on in their decision-making. How Do I Engage Undergraduates in Research? There is no one way to do undergraduate research. Undergraduate research can assume a number of forms, each allowing students firsthand experience in the process of creating knowledge. Choosing the right form is one step in designing an undergraduate research experience. It is also important to determine project needs and to offer clear expectations, structure, and support where you can. This site provides tips on how to identify, plan, and participate in the kind of undergraduate research experience that is best for you and your students. Contributors to this website have provided examples of undergraduate research experiences in their own classrooms. There are considerable references and resources on undergraduate research, both general and discipline-specific. Faculty and students can learn about undergraduate research organizations, programs and opportunities at the national, regional, and institutional levels.